The 10 miles from Aberystwyth to Llanryhstud are the most isolated on the Ceredigion Path and you will pass virtually no habitation along the way. 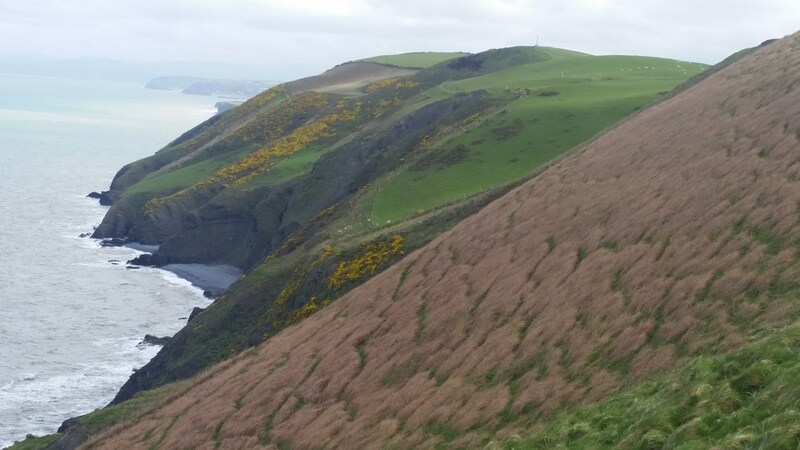 Much of the walking feels high in the heavens, with big cliffs and steep slopes which start almost as soon as you leave Aberystwyth. This whole section has excellent views both out to sea and inland, with gorse-covered hills rising on your left above you, leaving you to tread a somewhat precarious trail between the two. It’s an enjoyable and easy start, through the marina and harbour at Aberystwyth, before crossing the mighty Afron Ystwyth River and finally leaving the town behind. Tanybwlch beach stretches out towards the first climb of the day. It’s a nature reserve and Site of Special Scientific Interest and is overlooked by the imposing gorse clad hump of Penparcau Hill Fort, one of the greatest earth bank castles in all of Wales. This was the original settlement in the bay and today is topped with its huge memorial column to the Duke of Wellington. The beach is a tranquil setting for a spot so close to town, with the river Ystwyth meandering to your left between beach and hill fort, with the occasional whistles of the Vale of Rheidol railway adding to the atmosphere. In the 1830’s the top of the shingle bank was flattened to create a horse drawn tramway, bringing rock from the cliff quarries above you to the harbour to construct its seawalls, and you can still clearly see the where the route was levelled. Ringed plovers’ nest on the beach here, despite its proximity to the town and yellow horned poppy and sea radish, campion and holly grow freely. It’s worthwhile keeping an eye on the banks of the Ystwyth for the blue flash of a kingfisher as you walk. The easy stroll ends quickly, however, then it’s a monstrously steep climb up Alt Wen but the views are your reward as you toil upwards – some of the best yet. 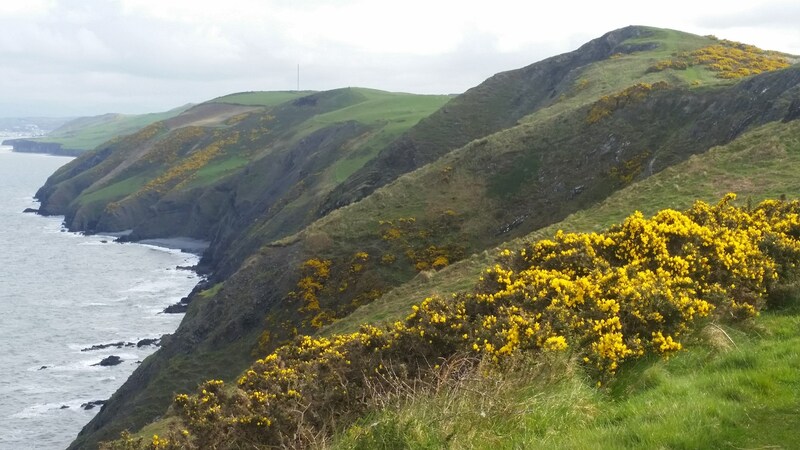 Looking over your shoulder, you can see the golden Dyfi Estuary and the start of the Ceredigion Coast Path whilst ahead of you, 2 days walk away, sits the harbour of New Quay and beyond is Cardigan Island – from here you have almost the entire path in view. Inland, the summit of the dark and brooding Plynlimon mountain gives an aspect not often seen on the coast path. It’s an exposed ridge scarred with 19th Century quarries and exposed rock faces, which add to the atmosphere. Thereafter, it’s a breezy cliff top ramble until you eventually descend using a wide greenway, constructed to bring up lime from the kiln on the beach at Morfa Bychan. This place was once the location of the monastic manor houses of the inland Strata Florida Abbey, now it’s a small holiday park nestled in a break in the line of cliffs. Another steep climb follows, taking you ½ mile inland into rich sweeping, hill-sheep territory with just an occasional farm. At Ffos-Las farm, you join a lovely ancient trackway where wiry bent double coastal trees form a long tunnel across the hillside, followed by an avenue of yellow gorse. It almost feels like the landscape is preparing to greet a royal visitor rather than a coastal walker. Beyond, you drop to the lowest point since Aberystwyth, an area where coastal erosion is evident and large, recent collapses in the cliffs force you inland on several occasions. In past times this section was a flatter more fertile corridor, a natural break in the foreboding cliffs which allowed for some settlement here, linked to the inland monasteries and a rare place for them to grow wheat and barley. Mynachdy’r Graig is the “Monk’s House on the Rock” harking back to the time when monks were sent here to establish farming and you can see remains of older buildings and stores from these days. At Twll Twrw (meaning ‘noise hole’), you pass ‘Monks Cave’, a large blow-hole in the cliffs below the path, which bursts into life at certain stages of the tide. It’s a steady climb up now and the gentle former monastic lands are left behind for the final push through a section of steep and harsh coastal cliffs and peaks. Halfway, a deep narrow gorge crosses the route at the Pinderi Cliffs Nature Reserve, a unique place where ancient, twisted, wind-swept sessile oaks suddenly appear on the generally treeless coast path. 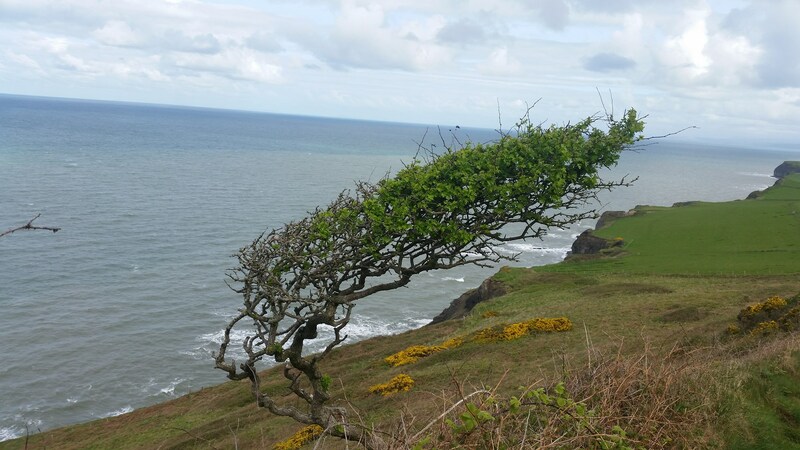 The stunted and exposed trees hang off the side here, in the harshest of conditions, taking the full force of the salty gales. On the other side of the abyss sits Pen Glog, a rocky pyramid like a miniature mountain, which menaces from on high. Above the path, buzzards, kestrels, peregrines and kites are often seen as well as choughs, stonechats and wheatears. Pinderi is now a Wales Wildlife Trust Reserve that clings to the cliff edge. There is a short walk through it for those with the nerve to get close to the drops. Despite its windblown spot it’s an excellent area for wildflowers with bluebells, campion, wood sage and ox-eye daisies and butterflies and there’s a good chance you’ll spot seals on the isolated rocks below. You are now on a rollercoaster of exciting and sometimes narrow sections of path. The scenery is untouched; there’s not a house in sight as you climb and descend some punishing sections, traversing your way along the spine of the coastline. 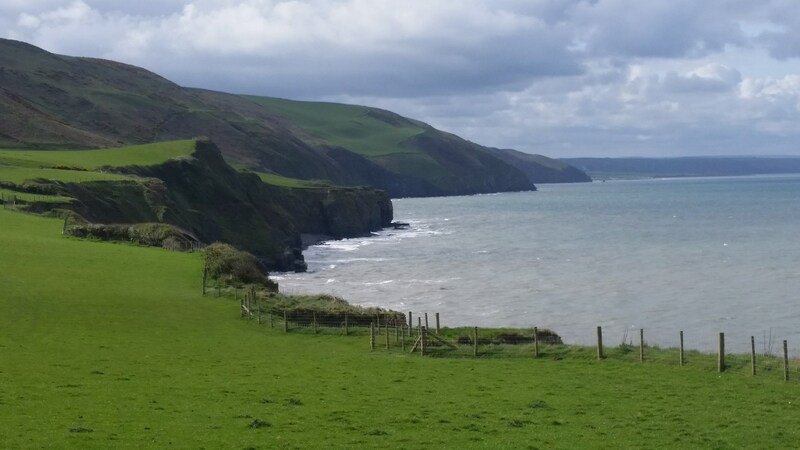 This is one of the most dramatic, isolated and windswept sections of the whole Ceredigion Coast Path and you will feel invigorated and very alive once you complete it! There’s a final big climb to an exposed peak above the prominent rocky stack at Carreg Ti Pw. After that it’s with some relief that you make a long descent back to sea level, skirting a caravan park - the first sight of habitation, at Pengarreg. Llanrhystud village is around ¾ mile inland from here but a pleasant walk on old tracks arriving by the bold looking 19th century church of St Rhystud. Despite the caravan site, it’s an unspoilt strip of nature - of the 26 species of butterfly in the UK, over half have been recorded in this immediate area.